The Svalbard Global Seed Vault can store up to 2.5 billion seeds, drawn from thousands of years of agricultural history. Deep in an archipelago, just a few miles from the North Pole, the temperature drops down to negative thirty. Polar bears and reindeer outnumber humans. There are no trees, no crops, just rocks, ice and snow. Yet tucked into an icy mountainside there sits a secure facility that could preserve life on earth and our food future. Ambitious and awe-inspiring, the Svalbard Global Seed Vault sits inside a 100-meter long tunnel dug deep into a mountainside, far away from the threat of nuclear war or catastrophic storms. The vault can store up to 2.5 billion seeds, drawn from thousands of years of agricultural history. Think: seeds to grow everything from ancient Chinese rice to California sunflowers. The seeds are backups of backups, copies of seeds stored in the 11 other international seed gene banks across the globe or in the regional and national collections. In total, there are about 1,700 seed banks around the world in almost every country. The Svalbard Global Seed Vault operates under a "black box system," meaning that ownership of any deposit remains with the depositor. As the largest and most secure collection of crop diversity, the Svalbard Global Seed Vault is arguably one of the most important. They’re seeds from forgotten plants. Most people don’t realize that up to two-thirds of the world’s diversity of crops have gone extinct. Blame mass production, environmental conditions and changing consumer preferences. Back in the 1880s, for instance, the United States had 7,100 named varieties of apples. Today, we’ve lost about 6,800 of those family varieties. Bananas, it seems, are also under the threat of extinction. First opened in 2008, the vault serves as a fail-safe storage facility for the world’s seeds, especially those that are most important for food security. 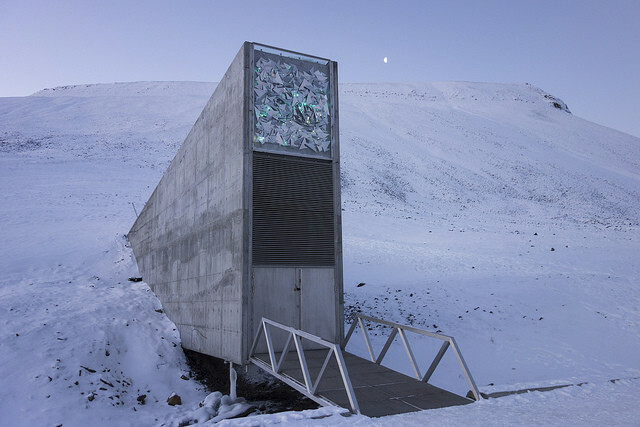 The remote location of the seed vault is strategic-- far from the threat of nuclear war and most weather catastrophes. But it – like other genebanks- also serves as a vital genetic library, housing a vast range of unique traits that will become essential tools for breeding as crops struggle to adapt to climate change, says Marie Haga, executive director of the Global Crop Diversity Trust, or the Crop Trust. That, says Haga, is really the fundamental challenge for agriculture today. She wants to help wheat, for instance, adapt faster by introducing genes from wild relatives of the crop that can grow in a challenging climates with less water or that can fight a new disease stemming from climate change. Inside the mountainside, the Svalbard Global Seed Vault spans nearly 500 feet long and twenty feet high and uses airlock doors to keep cold air inside. The Crop Trust wanted to find the coldest spot possible to store the seeds to ensure that even if electricity failed or the permafrost above melted, the seeds would remain preserved for a number of years. But all this takes money. The Crop Trust has an endowment fund to maintaining the vault and other key international, national and regional collections. The goal: $850 million by 2022. Yet few people know about the seed banks and the vital importance to our world. Tender Greens wants to change that. The bustling tables at our restaurants are a far cry from the frozen permafrost of the seed vault. Yet we at Tender Greens are taking a special interest in seed banks, partnering with Haga and local farmers to diversify our crops and introduce people to different varieties of food. We’ll work with local farmers to plant seeds drawn from the U.S. seed bank in March to see which ones will do best in the New York and California climates, and by this summer, our chefs will serve up these ancient foods onto the menus at our restaurants. The idea: keep biodiversity alive by giving people a true taste of food that’s connected people over centuries.